Health Science students practice ambulating patients properly using a gait belt for safety. This is one of the basic skills necessary in order to pass the certification exam for Certified Nursing Assistant. Commerce and Information Technology students are preparing an 'All About Me' project that they will present to their classmates. This not only allows the students to become more familiar with each other, but also enhances their public speaking abilities. Automotive students begin the year by reviewing internal engine components through disassembly of power sport and automotive engines. Second year students act as mentors as they guide the first year students through the tear down process. Building Construction students use a lathe to turn blocks of wood into miniature baseball bats. Students are learning to use the lathe by identifying the different working/non-working components of the machine, how to select the correct cutting tools, and keeping a steady hand and focus. Centreville Middle School's 8th graders spent the afternoon with Bibb County Career Academy's teachers and students. They not only toured the school, but also received hands on training! Mrs. Barbara Terry and her Health Science students attended HOSA Day hosted by UAB School of Health Professions. More than 1,000 students from different schools throughout Alabama participate in hands-on lab work in some of UAB's most exciting programs including: biotechnology, occupational therapy, respiratory therapy, and physical therapy. This student is in the occupational therapy lab learning the proper way to use a cane while descending stairs. Harold Parker, Director of Workforce Development at McAbee Construction visited with Mr. Tony William's welding students this week. Mr. Parker gave students information about the apprentice training they offer as well as how the students can apply for these opportunities. 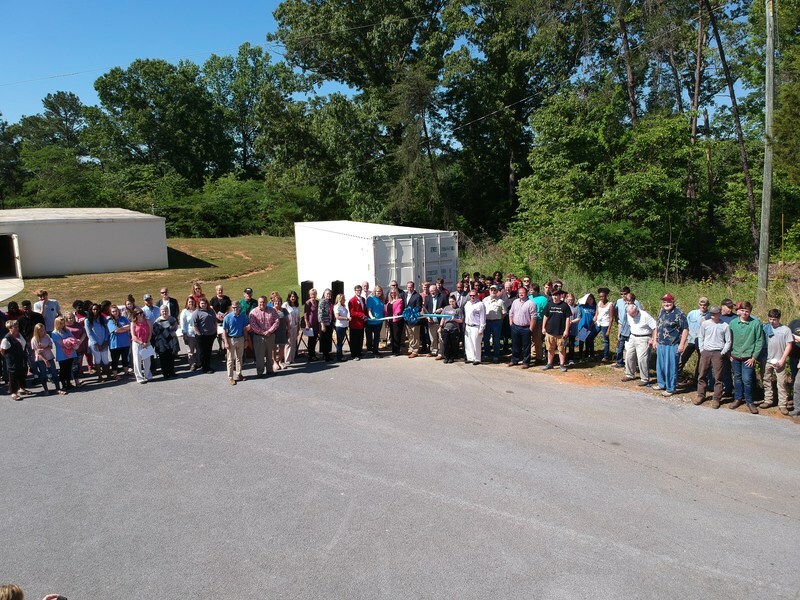 BCCA staff recently toured Mollertech, and got an opportunity to see their manufacturing process, speak with employees, and learn about the type of positions that will be available. February 2018 morning students of the month. February 2018 afternoon students of the month. Welding students cut a square hole in the sheet of steel using an Oxy-Acetylene torch. The hole will house a square steel tube that will be welding into place. Mr. Steve Cottingham and his class have been studying the importance and process of maintaining healthy cows. They discussed how to repel flies and the damage the fly can cause as well as the issue cows can have with mastitis. This student gets hands on experience learning how to milk this Jersey. Mr. Steve Cottingham's students discuss the role the goat plays in milk production. Goat milk is the world's primary source of milk for humans. It is sought after for the perceived health benefits and unique taste. Often times when a person is allergic to cow milk they turn to goat milk for a healthy alternative. Welding student uses a grinder to cut a piece of square steel tubing to be used in a project the program is working on. Mrs. Horton's cosmetology student receives tips from a Winonah student on how to put hair up into a specific style. Cosmetology students will travel to Wallace Community College in Selma for the ACE competition later this semester. BCCA's Cosmetology students were visited by students and instructors from Winonah School of Cosmetology located in Hoover. They gave valuable information on how to apply to the school, how to apply for financial aid, as well as demonstrated braiding and up-do's. O'Reillys Auto Parts just donated a 160 piece tool set and 2 ton jack with stands to our Honduras Sister Schools storage container career tech classroom project. Going to State! 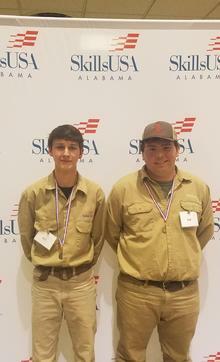 Automotive students took home 1st and 2nd place at the Central District SkillsUSA automotive competition. Afternoon January 2018 students of the month. 2018 January morning students of the month. Building Construction students unload donated treated lumber for the Honduras Sister School project. These supplies were donated by G & H Building Supply of Centreville and Harper Chambers Lumber Company, Inc. in Tuscaloosa. Automotive Service students start work on the shipping container bound for Honduras. They are sanding the container which is the first stage of preparations for it to be refinished. Health Sciences students prepare a banner for an upcoming HOSA competition. Students will travel to Montgomery for the State HOSA competition in February. Agriscience students have just resupplied this bee hive with sugar water. Agriscience students take a look at how much honey this bee hive has left over after winter. BCCA automotive student and SkillsUSA state president recently attended the state capitol to meet with other Career Tech officers and Governor Kay Ivey during the Governor’s Career Tech Proclamation event. Mr. Steve Cottingham gives the Chamber of Commerce members a tour of the greenhouse where Agriscience students learn about plants and plant biology. Automotive students get a chance to show off their Automotive Services program to the Chamber of Commerce members. Mrs. Sheila Beam gives the Chamber of Commerce members an update on where her Cooperative Education students are currently working. Business students discuss the importance of constructive criticism. HOSA students discuss the importance of work ethic. Co-op student gives a description of his experience with the BLG Logistics Internship to his fellow students. Collision and an Automotive student work together to prepare a Jeep Wrangler for paint. Cosmetology student demonstrates her technique for sewing in extensions. Mr. Franklin takes time to welcome students to Bibb County Career Academy. November morning students of the month 2017. November afternoon students of the month 2017. BCCA Cosmetology class tours Virginia College in Birmingham. Cosmetology students fill out a pre-application form at Winonah's School of Cosmetology in Hoover. Automotive students created handi-capped parking spaces here at BCCA. October 2017 BCCA Employees of the Month. Automotive student interning with the newly developed Mollertech. Health Science students celebrating HOSA week. Automotive students visiting the Mercedes Benz technician program at Shelton State Community College. HOSA intern students on the job at BMC with CNA Keyonna Hill. Agriscience students get a lesson on how to trap animals from Wildlife Specialist Mike Sievering while at Bibb County Lake. HOSA intern student in the field with Dr. Richardson of BMC. Co-op students on their first day of hands-on training at BLG Logistics. Business students hand out drug-free bookmarks and bracelets for the students who make the pledge to be drug free. Business students made posters to promote Red Ribbon Week and to be drug free! Local officer and SkillsUSA state president speaking to other students about leadership. Building Construction students working in the shop. Automotive students earning student ASE certifications. Automotive students at the 2016-17 SkillsUSA state conference. Automotive Hot Rodders team putting on an exhibition at the 2016-17 Alabama Auto Show at the BJCC. Automotive students helping in the community with Community Services of West Alabama. Cosmetology students washing mannequin heads to learn new styling techniques. BCCA students talk with representatives from Lawson State Community College. Automotive and Welding District SkillsUSA competitiors 2016-17. BCCA students complete transforming shipping container into vocational classroom.